What do you consider private? Are you happy for your phone number to be searchable online? Your age? Your home address? Your current location? Your browser history? Your tax return? Most of us will reply with a mix of yes and no answers, although some will answer negatively to all of them. But undoubtedly your view of what’s private and what you are comfortable sharing online have changed over time. Less than a decade ago we hid behind avatars and handles for online communications but Facebook managed to change the paradigm with its real names policy. 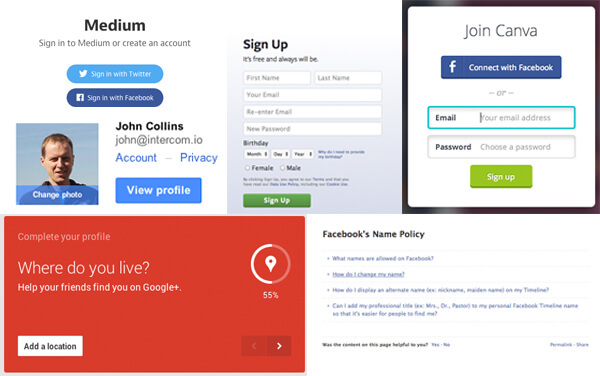 The hard line on real identity was a huge differentiator for Facebook. It generated controversies and when Google+ followed suit it even sparked the “nymwars” but overall it was a ballsy move that worked for a young company building a user base. People signed up because they knew they could share their lives just with their friends. The tactic was so successful, aided and abetted by the spread of Facebook’s social sign-in to other services, that real names rapidly became the norm on the web. Google also bases its social efforts, and supporting advertising business model, around real identities. At least in part because it has been quicker to monetize ads around users search and email, Google has faced more criticism for its data collection practices. During his time as CEO Eric Schmidt said online anonymity was dangerous, but was at pains to stress that anonymity is not the same thing as privacy, which deserves to be protected. A European court ruled recently that Google shouldn’t display search results which are deemed to be no longer relevant and could in fact damage a person’s reputation, which will force it to make hard and messy decisions about where the line is drawn between individual privacy and the public interest. Mark Zuckerberg now admits the pendulum may have swung too far. “If you’re always under the pressure of real identity, I think that is somewhat of a burden,” he told BusinessWeek in an interview to mark Facebook’s tenth birthday. The simple narrative is that there has been a backlash amongst web users who don’t want to trade their privacy for “free” services. The revelations by Edward Snowden about state-sponsored surveillance cemented that view. The reality looks more complex however. If you look at the blunt metric of searches, we’re less interested in privacy than we have ever been. While privacy and surveillance have been a huge focus for the global media in the last year – in large part because of the threat presented to a free press – these concerns are not necessarily reflected in the general population. While admittedly a crude measure the Google Trends graph above shows searches for “privacy” and “surveillance” actually peaked back in April 2004 and interest has been steadily waning since. Zuckerberg’s pendulum analogy is apt. The concept of privacy is not fixed but has ebbed and flowed throughout history. In the 17th and 18th centuries there was little or no privacy in homes – it wasn’t unusual for a number of family members, and even house guests, to share the same bed. In the eighteenth century letters sent through the US mail system were routinely opened in transit with no guarantee of confidentiality. That came in 1782 with an Act of Congress although the technology which gave effect to it, sealed envelopes, weren’t invented until the middle of the following century. Privacy as a legal right only began to gain currency in 1890 with an article, “The Right to Privacy”, in the Harvard Law Review which reviewed case law to date and concluded privacy was a distinct right of citizens and deserved protection. 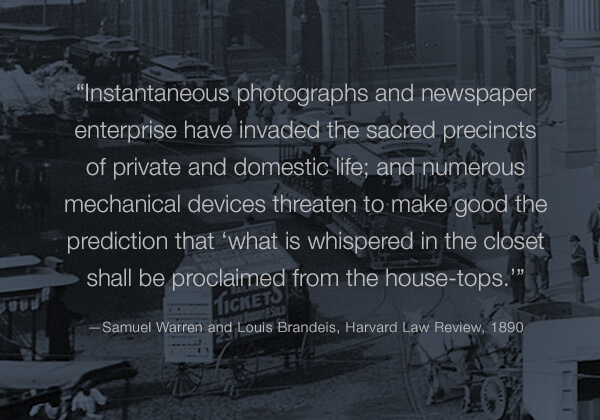 The authors, Wealthy Harvard graduates Samuel Warren and Louis Brandeis, were reacting to what Warren felt were intrusive reports of the wedding of his daughter in Boston newspapers, and parts of their argument echo some recent commentary about online privacy. Now we’ve progressed to the point privacy is considered a fundamental human right, enshrined in the UN Declaration of Human Rights, and numerous other pieces of local and international legislation. At a minimum most states provide constitutional protection for the sanctity of the home and secrecy of communications. The focus on privacy and online tracking presents clear opportunities for the creation of new products and services. Here’s two significant themes that have emerged. Following Snowden’s revelations about state surveillance online there has been an intense focus on privacy and what data is being collected as we move around the web, and that has had profound effects for the design of products. Launching a search engine, even one providing answers rather than links to web pages, seemed crazy in 2008, in the face of Google’s dominance, but DuckDuckGo founder Gabriel Weinberg was clever enough to listen to users. Based on feedback from early users, by his own admission the “tech heavy” crew at Hacker News/Reddit who are privacy minded, Weinberg decided strict privacy practices could become his unique selling point. DuckDuckGo doesn’t store users’ search history or pass tracking cookies to advertisers. 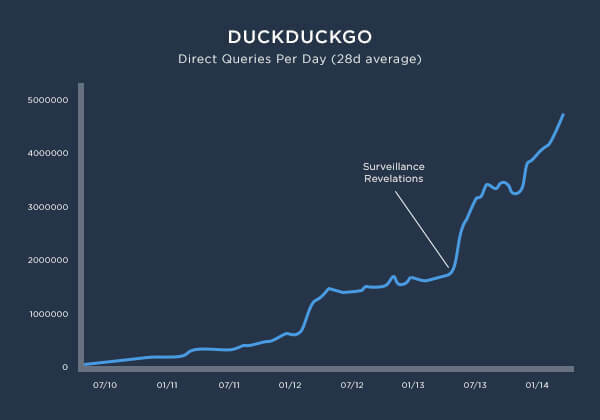 DuckDuckGo enjoyed steady growth based on that reputation but as this graph shows, it doubled the amount of queries it handled in the days after Snowden’s revelations. Similarly a whole host of companies – Hushmail, Lavaboom, Silent Circle, and Countermail – have made a business out of secure, private, web-based email. The takeaway? If there is a vocal group of users expressing dissatisfaction with the way incumbants are handling identity, privacy or security then that’s something they might be willing to pay you for. Disruptive messaging apps also spotted an opportunity in Facebook and Google’s big data practices. 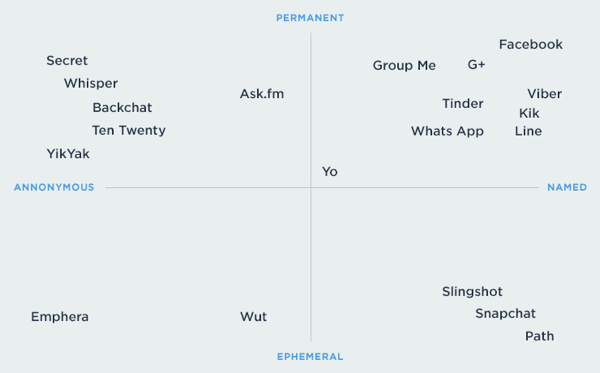 What’s App offered flexible ad-free messaging allowing groups to quickly form and dissolve. One of its unique selling points pre-Facebook acquisition was the minimal amount of data collected about users. Snapchat started off with picture messaging but once it started to gain traction the popularity of its self destructing messages saw a rush to embrace ephemeral messaging by app makers. Social network Path recently made all its messages temporary – they disappear after 24 hours – and cited privacy as the logic for the move, while Tinder has introduced a Snapchat like feature for sharing pictures with your matches which disappear after 24 hours. Apps like Whisper and Secret have added the logical next layer – anonymity – although it’s far from clear how absolute privacy is on those platforms. Their Achilles Heel is that they have access to your contacts and/or location and require you to identify yourself to them. Whether they can protect that information from court orders, government snoops or malicious hackers remains untested. Through the prism of the simple linear narrative of privacy the popularity of these apps is simply explained. But arguably rather than privacy the most important ability they offer is a flexibility, a loose coupling, that is anathema to the real names, tagged photos and fixed relationships of Facebook. It’s easy, particularly post-Snowden, to fall into the trap of thinking the Internet is just a threat to privacy. But there are so many examples of how it has facilitated private communications for everything from political organisation during the Arab Spring to couples getting together who may never have met otherwise. We’ve also seen a huge rise in trust between strangers which has been made possible due to online reputation systems. We’ve rapidly moved from sharing information – our experience at a restaurant or hotel, a review of a new product – to sharing our physical stuff. 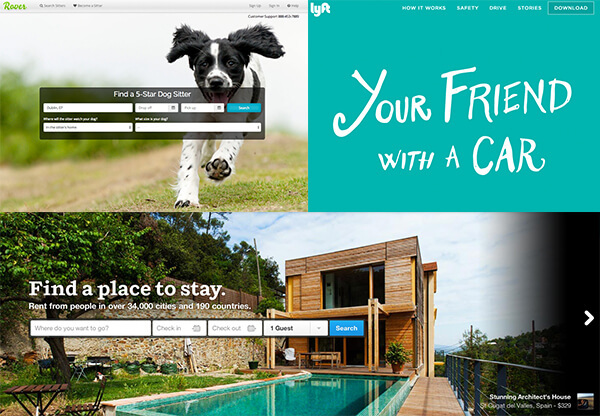 People are now opening up their homes to strangers (Airbnb), driving them places in their cars (Lyft) and even dropping pets off at their homes (Rover). Privacy has evolved and changed in modern society, will continue to do so, while technology is usually playing catch-up with what society deems correct. This is similar to how sealed envelopes were invented decades after the US authorities enshrined the right to private communications in law. The pendulum of privacy swings both ways for products. Depending on your viewpoint, it can be a flaw or a feature, and there’s usually a product on both sides. Twitter lets the whole world see your messages, while WhatsApp promises to let you speak in private unsearchable groups. Instagram shows the whole world your photos forever, where Snapchat lets you share them temporarily. Users are increasingly making judgements on which side of the line products fall on. The majority are comfortable trading personal information to use products, but could easily turn against this as a standard practice. The more information gathered and the more personal the nature of it, the higher the stakes.